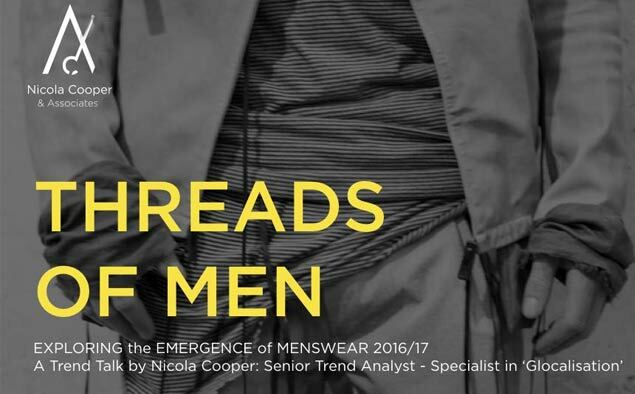 Nicola Cooper, Senior Trend Analyst is presenting an exciting new Trends Talk called THREADS OF MEN at SA Menswear Week on Friday the 5th of February 2016 at 10h00. The talk will last approximately 2 hours including an interactive Q&A Session. In this explorative, illuminating, and insightful Trend Talk, Nicola Cooper examines the rise and subsequent trajectory of menswear over the past three years. Assessed and analysed from consumer insights, the talk investigates the influences which weave into the fabric of masculinity. In addition to the above, the Trend Talk will highlight significant trends from the recent, New York, and Paris menswear shows. Who should attend? This presentation is a must for anyone in the fashion design, media, advertising, marketing, entrepreneurs or businesses hoping to gain interest in new emerging markets and relevant retail industries. The Talk will be held at the SAMW venue within the Cape Town Stadium on Friday 05 February 2016. Tickets to this talk are strictly limited to 100 people, and due to the high demand, we recommend you get your tickets as soon as possible. These are available under the SA MENSWEAR WEEK ticketing on www.webtickets.co.za.